If you want to know how to become a registered nurse, we can help! You may have lots of questions, including how to get started. Maybe you’re wondering which are the easiest nursing schools to get into. Many potential nursing students wonder long it takes to become a nurse. Well, we have the answers you are looking for. You can also contact our RN on staff with any nursing school questions we don’t cover. There are three basic ways to become a Registered Nurse. First, find and complete a diploma program (pretty rare these days). 2nd, earn an Associate’s Degree in Nursing (ADN) or earn a Bachelor of Science in Nursing (BSN) degree. On this page, you’ll find details about what the process entails from start to finish. Click on the nursing schools below to for more information. Additionally, you can find programs near you with the search box above. Read more to learn about the specifics of each degree, including program requirements. On this page you’ll also learn about your job prospects and salary potential as a registered nurse! A registered nurse (RN) is a professional healthcare provider who has completed educational and license requirements. Requirements which have been laid out at the state level. RN’s are at the frontlines providing patients with direct care in a variety of settings. These environments can be anything from clinics to operating rooms to boardrooms. All combined, RNs makeup the largest segment of health care workers in the nation. There are three ways to become an Registered Nurse. One challenging aspect associated with each path is finding the right program for you. For that reason, we focus mainly on Associate (ADN) and Bachelor’s (BSN) programs. Both nursing tracks prepare you to work with patients, earn your RN license and enter the field with solid experience. The answer depends on which kind of registered nursing degree you choose. An ADN will take two years full time, and a BSN will take four years if you attend full time. Regardless of the path, you will need to follow the steps outlined below before starting your career. Apply to and enroll in an ACEN (Accreditation Commission for Education in Nursing) or CCNE (Commission on Collegiate Nursing Education) accredited nursing school. Complete nursing coursework, clinical rotations and college graduation requirements for your nursing school. This will take at least two to four years, depending on type of program (Associate or Bachelors). Take and pass the NCLEX-RN (National Council Licensure Examination-Registered Nurse). Apply for and meet the criteria for RN licensure with your State Board of Nursing (BON). There are two sets of requirements to get your RN license: first, you must complete your education; secondly, you must apply for your RN license. Your education is the basis of everything you will do as a registered nurse. That’s why it’s important to choose an accredited nursing school approved by your state board of nursing. Nursing education consists of didactic courses (classroom, lecture and book-based) and clinical (hands-one) rotations. In both Bachelor and Associate level nursing programs, you will learn: patient assessment; nursing processes and procedures; how implement nursing care plans to achieve optimal patient outcomes; how to provide patient, family and community education strategies; intra-professional communication; critical thinking and clinical reasoning; evidence based care standards; and human care throughout the lifespan. You will take anywhere from 70-130 credit hours to get your RN, depending on whether you go the Associate or Bachelor in Nursing route. While each degree prepares you to become a registered nurse, programs will offer different levels of preparation. An associate degree covers all of the technical and essential aspects of working as an RN safely and legally. A bachelor’s degree provides deeper instruction into nursing theory, community and population based nursing, leadership and general education. The most hands on portion of getting your nursing degree will be your clinical courses. They typically accompany a corresponding lecture class, and provide you the chance to put your skills to use as you are learning them. For instance, while you are learning about geriatrics, you may be doing nursing clinicals at a local long term care facility. While you learn basic nursing fundamentals, you’ll likely be doing a clinical course in your school’s simulation lab. And yes, if you are taking your obstetrics and gynecology course, you’ll most likely be doing clinicals in the labor and delivery unit of a hospital. In addition to your theory courses and clinical rotations, you may also be required to complete an internship, especially if you enroll in a BSN program. Nursing internships usually last a semester and can be completed at a healthcare facility of your choice. The second step in becoming an RN is to get your registered nursing license. For this, you will need to apply to your state board of nursing and pass the NCLEX-RN. This examination is nationally standardized to assess your nursing knowledge. You complete it after you have completed all of your nursing classes. You can read more about taking the NCLEX-RN in our FAQ and Articles sections. Once you pass the NCLEX, you can complete the process of getting your RN license. You will need to apply for nursing licensure through your state board of nursing. This typically entails a background check, application fee, submitting transcripts from your nursing school and registering with your state department of health. Once your application is accepted, and it is determined that you meet all the requirements, you will be issued either a single state or multi-state registered nursing license. You will need to renew your license regularly and maintain your nursing practice and continuing education hours to stay current as an RN. Diploma programs are offered through health care facilities. If you are interested in an RN Diploma program, you can look at hospitals in your area to see if this option is available. Diploma RN programs are typically quite robust when it comes to the clinical aspects, but offer a well-rounded didactic experience as well. Though these were once the primary route for becoming a nurse, these registered nurse programs are less common in the twenty-first century. For that reason, we tend to focus more on the associate and bachelor degrees offered at colleges and universities at BestNursingDegree.com. An ADN program is the fastest way to become a registered nurse. These degrees are commonly offered at community colleges and tech schools, and take about two years to complete. They require around 70-80 credit hours to complete and offer a thorough nursing education. The BSN degree is four year degree that exposes you to all the nursing knowledge you need to practice safely, combined with the general education requirements that any bachelor degree program requires. Most healthcare facilities prefer to hire RNs with a bachelor’s degree and it is noted that patient outcomes improve as education expands. A BSN takes anywhere from 120-140 credit hours to complete. In addition to courses in nursing theory, clinical rotations, population health, and nursing leadership, you will need to complete general education requirements as set forth by your school. Nursing courses usually comprise the majority of classes, but you’ll earn at least 40 credit hours of generals as well. All of the RN programs above can prepare you to work in hospitals, nursing homes and community settings. The most important thing to consider when choosing how to become a registered nurse is this: what program best fits your personal lifestyle and learning abilities? 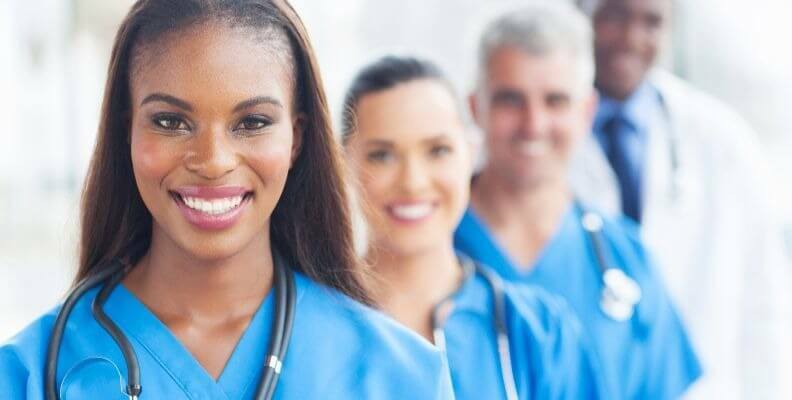 Choosing a nursing school based on what is going to work well for you is the easiest way to decide which nursing program is best. If you already have a non-nursing bachelor’s degree and want to use those credits to become a nurse, you will want to look for an Accelerated BSN program. This is a direct route to becoming an RN with the education you already have. Of course, no discussion of how or why to become a nurse is complete without mentioning what to expect when you graduate nursing school. As a registered nurse, you can expect to see a significant number of job openings across the U.S. and hopefully in your area. While some health care employers prefer to hire only experienced nurses, several are willing to hire new grad RNs on a variety of units, from skilled care to intensive care. Some facilities, like the VA (Veteran’s Administration) and Magnet facilities do prefer BSN prepared RNs above others, but in general, your education is less relevant to employers than your license. An RN is an RN, no matter how you got there. As such, you can reasonably expect to earn a wage comparable to other registered nurses in your area of practice. Of course, RN salaries do vary by region, experience level, metro area and employer. So, how much does an RN make? The annual mean wage for registered nurses is currently $72,180 in the United States (Bureau of Labor Statistics, 2017). While there is certainly a low end and a high end, the median range reflects the most current figures from all states and employment areas. Are you ready to move forward and become a nurse? Now that you know the difference between the different ways to become an RN, explore the schools on our website to request more information. Choose those that are nearby, offer the programs you are most interested in and are accredited as providing the nursing education you need to succeed. How Do I Choose the Right Nursing School?